A-FOOT which is attached to Presser Bar. B-FORK ARM must be placed astride the needle clamp. C-ADJUSTING SCREW. Holds fullness of gathers or plaits. D-PROJECTION. Fits through slots in Adjusting lever. E-ADJUSTING LEVER. Used to set the Ruffler for gathers or plaits. F-POINTER. Determines size of plait or fullness of gathers. G-SEAM GUIDES. On Ruffler separator. H-RUFFLINC-@ BLADE. The upper blue steel blade with feeth at end. J-SEPARATOR. The lower blue steal blade which prevents feed blade contacting feed of machine. K-DIAL has numbers from 1 to 8 which aid in setting fullness of ruffle. L-HEADING GUIDE can be adjusted for different size headings. M-LIP which separates seam guides. N-SLIDING GUIDE can be adjusted for different width seams or headings. line 1-Is under the Ruffler and indicates the position for the garment to which ruffle is to be stitched giving a 1/4 inch seam. Line 2-Between the blue blades where the feed blade will gather or plait material with a 1/4 inch seam. Line 3-The upper piece of material used when ruffle is enclosed between two pieces of material. Line 4-Guide for piping strip. line 5-For edgestitching material to ruffle that is entered from right. The Ruffler will make ruffling and plaiting in uniform fullness, or with simple adjustments, can be made to vary fullness of ruffle and accomplish grouping of plaits or gathers without removing Ruffler from machine. Remove presser foot and holder screw from machine. 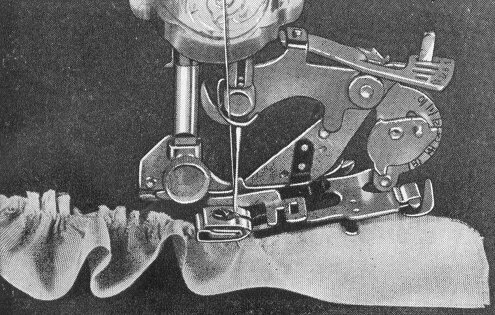 Attach Ruffler Foot "A" in its place with Fork Arm "B" astride the needle clamp. When Ruffler is in position tighten holder screw firmly. Turn hand wheel slowly to see if needle passes through the cenfer of the hole in foot of Ruffler. Slot 1 on Adjusting Lover "E" must always he over Projection "D" for gathers. Place material to be gathered between the blue blades of the Ruffler following line 2: push forward until material is under the needle, lower presser bar and be ready to stitch. 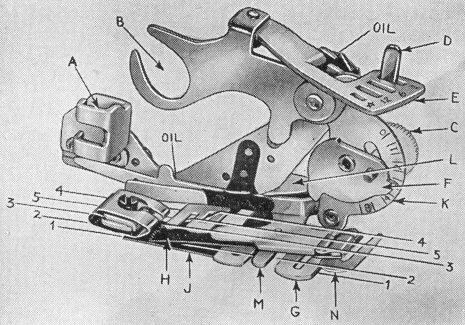 To make a scant gather put slot 1 on Adjusting lever "E" over Projection "D". loosen Adjusting Screw "C" and set Pointer "F" at figure 1 or 2 on Dial "K". Tighten the Adjusting Screw "C" securly and test fullness of gathers. By setting Pointer "F" at different numbers, and changing fhe length of machine stitch, a variation from a scant to a full ruffle will result. The widest plait is obtained when Pointer. "F" on Dial "K" is as far forward as possible, away from you, number 8 on Dial "K". To set Ruffler for plaiting Loosen Adjusting Screw "C" and. set Pointer "F" at 8 on Dial "K". Tighten Adjusting Screw "C" securely. Plaits can be stitched close, or for apart, by placing slot 6 or 12 in Adjusting lever "E" over Projection "D". for plaits set close together place slot 6 over Projection "D". Place slot 12 over Projection "D" for plaits, stitched farther apart. Changing the stitch length on sewing machine will produce different spacings. Plaits in groups can be accomplished with this Ruffler. Set slot 6 on Adjusting lover "E" over Projection "D". Stitch, making the number of plaits desired in a group. 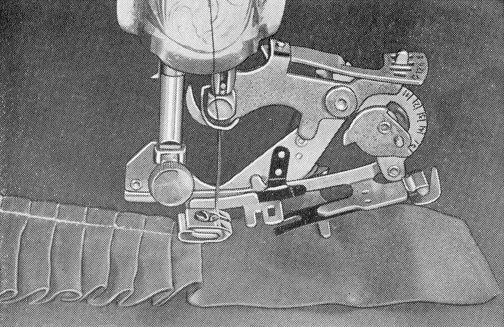 Place slot with star on Adjusting lever "E" over Projection "D" and stitch without any action from the Ruffler until desired space between groups is obtained. Place slot 6 on Adjusting lever "E" Projection "D" for each successive group of plaits and place slot with star on Projection "D" for each space. 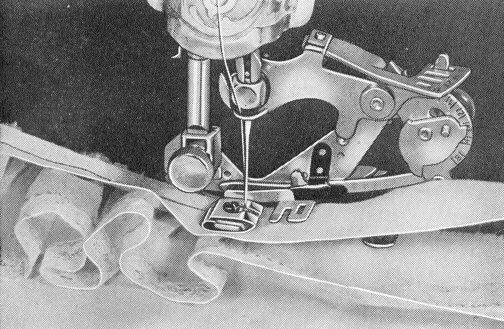 To gather and sew a ruffle to a garment in one operation, place material to be ruffled between the blued blades of the Ruffler following line 2 and place garment to which ruffle is to be applied under the Ruffler following line 1. To add a facing at the same time, place. the facing on top of the blued blades following line 3. To pipe and enclose ruffle in facing place edge of facing under ruffler from left following line 1. Enter ruffle to be gathered between blue blades following line 2. Cut a decided point in piping that has been folded and cut 1/4, inch wide and enter it in piping guide "H" with fold of piping toward the left. Place garment over all guiding its searn edge along the slide of ruffler. Turn facing to the wrong side and fasten to garment.